The best vacation spots for couples are fabulous to enjoy all through the year in the Caribbean. In all the islands you will find a place that provides that excellent atmosphere for romance. However, with these wonderful choices finding a spot that is unique to your vacation needs can always be a tough decision to make. You will find that there are amazing romantic private islands, secluded hideaways, excellent adults only all inclusive resorts and some fantastic locations that give you the opportunity to relax in some delightful villas. 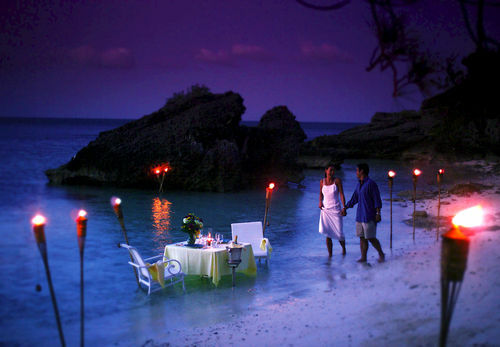 Therefore, finding a romantic spot in the Caribbean will not be an easy task. Let’s explore some of the top locations in the region for this type of vacation. Additionally, the links below will allow you get amazing online deals to the various resorts highlighted here. 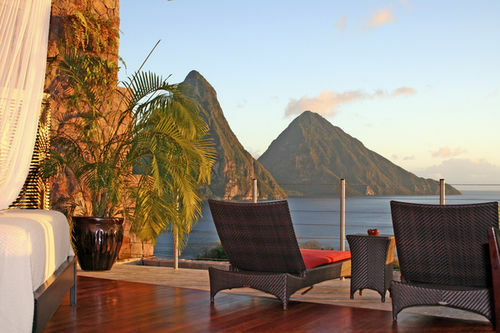 The island of Saint Lucia is one of the best vacation spots for couples to enjoy a Caribbean romantic vacation. Located south of the French island of Martinique and north of Saint Vincent and the Grenadines the country is one of the easier destination to reach from international destinations. 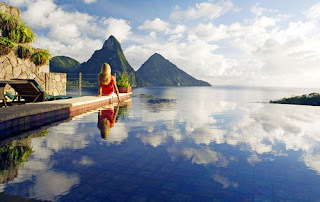 Of the many couples holiday spots in Saint Lucia the Jade Mountain Resort in the south of the island provide some excellent features for couples that needs seclusion on their vacation. This hotel is located in the southern section of the island in viewing distance of the gorgeous Piton Mountian. You will find some excellent suites that are everything about privacy that you will want to enjoy. However, one of the challenges is little entertainment is done at the location. However, you will find some amazing attractions around the island when you choose to go on excursions to different parts of the islands. It is also important to note that this is resort that require you to doing a bit more walking than most resorts in this category. Therefore, this spot is not for couples that are not active. The Atlantic island of Berbuma is another small island that is excellent for an adults only vacation. Bermuda is outside the Caribbean, so the best time to visit the island to enjoy some warm temperature is May to October. However, this is one of the couples vacation spots that you will find excellent private beaches and delightful landscape to enjoy and relax. This in one of the romantic resorts you will want to visit with its excellent spa treatment option. There are also opportunities to play golf and dine at some of the best restaurants on the island. One of the challenges you will find is that although the resort is an adult only all inclusive resort there are a few months of the year where families are welcome. This is another wonderful spot for seclusion. The Fairmont Royal Pavilion is one of the top couples vacation resorts you will find in Barbados. This is one of the top vacation islands in the Eastern Caribbean. This is another of the places in the region that offer adults only vacation during the peak vacation season in the Caribbean. You will find that the location creates an ideal atmosphere for with its spacious rooms, fine dining rooms and excellent spot to view the beach. One of the things you will of the Barbados is the opportunity to enjoy water sports. On the southern and western coast of the island you will find some amazing beaches for that provide all the fun filling water sports activities you will want to enjoy. However, you will find that the Fairmont Royal Pavilion in not located close to many of the top attractions on the island, but this will give to the opportunity to tour some of the top attractions on the island that is really romantic to enjoy. The Sandals resorts are some of the best adults only all inclusive holiday spots in the Caribbean. You will find them in Grenada, Saint Lucia, Antigua, Jamaica and the Bahamas. These are just ideal all inclusive adults only vacation resorts for all forms of romantic vacations. The Sandals Royal Plantation Resort is one of the locations that will give you access to some of the top attractions in Jamaica. It is a spot in Ocho Rios provides an excellent place to you to enjoy the much talked about Dunn’s River Waterfalls, and the Mystic Mountain Adventure Park which are just fabulous places to enjoy all through the year. There are an excellent golf course at the resort, great food, and exceptional services that will guarantee you a great experience on your romantic holiday. One of the things you may have a little challenge with is you will have to travel for up to two hours to reach the resort from the airport in Montego Bay. There are many great places right across the Caribbean to have romantic vacations. However, you will all find it a challenge to find the one that is most ideal for you. The resorts that are listed here are great spots to have aromantic vacation. You will find that these couples getaway resorts are excellent places to stay, despite some minor issues. You will find the every resort will have theirs as well. Moreover, the resorts mentioned have one thing in common and that is to create the ideal couples vacation spot that provides most memorable romantic experience you will find in the Caribbean.